Under the Microscope – YoU! 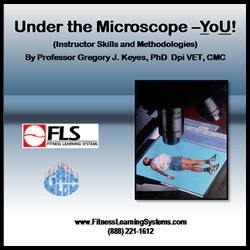 As a health-fitness professional, especially in exercise science, you are consistently under the scrutiny of your clients, employers’ and a multitude of other observers. As a result you must continually look at methods to enhance and share your knowledge so you can simply be the best you can be. This course shares a multitude of skills and knowledge that will help develop all who present or teach. This course will help bridge communication gaps, further open the channels of sharing by you to all your clients and prospective clients, and enhance various domains of leadership. These tips, hints and in some cases in your face frank observations are shared to ensure your professionalism remains top of your game. The intent is to help ensure your example of leadership and demonstration is a showcase for other health-fitness professionals to emulate. Learn the anatomy of the voice. Learn nonverbal communication techniques including emergency communication signals and EZQ signals for land and water. Learn the Neuro Linguistic Recognition domains and how to balance them to create rapport with clients. Understand the role proxemics and body language plays in client rapport. Review some rapport creation methods.